Robin Browning is an established conductor, performer & music-educator, with a proven track record of electrifying performances, a comprehensive repertoire and engaging approach with orchestras & audiences around the world. 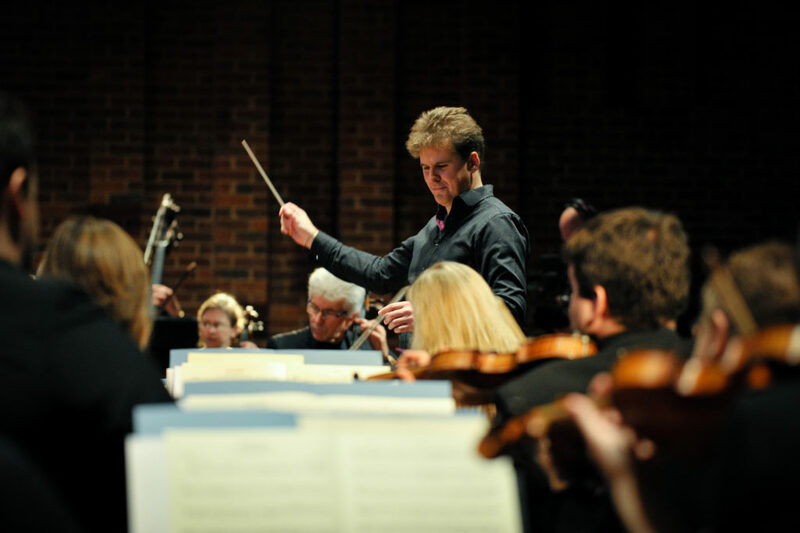 He is Artistic Director of SÓN – the UK’s newest professional orchestra – and recently assisted Paavo Järvi on his Nielsen Symphony Cycle with the Philharmonia Orchestra. Alongside SÓN, Robin is Music Director of the renowned de Havilland Philharmonic, and has conducted the RPO at London’s Barbican Centre, the Hallé, St Petersburg Festival Orchestra, Danish Radio Orchestra, Ensemble Intercontemporain and made his US debut with the Boise Philharmonic in 2011. Click the button to watch a fascinating short film exploring Robin’s relationship with SÓN – in rehearsal, performance and interview. An accomplished recording artist, Robin has four commercially-produced studio recordings to his name. The most recent, In My Childhood, is a collaboration with Seamus Heaney, composer Raymond Warren and musicians from the BBC Symphony Orchestra. All are available to buy and download from iTunes, Google Play and Amazon. Click below to hear sample tracks and live recordings. Every season Robin conducts & presents a series of innovative family concerts showing the power of music to children, alongside celebrated children’s author & illustrator James Mayhew. Over recent years, their work together has inspired thousands of youngsters to explore more music. This inspiring film shows Robin and James motivating the musicians of tomorrow. Click here to learn more about their projects. - Andrew Bell "The Oxford Info"
SÓN. The UK’s newest professional orchestra. Established in 2015 and already creating a buzz with innovative programming & sell-out concerts, són are a vibrant professional orchestra, with big plans and a bold future. Launching their second season, 2016-17 brings Piazzolla & Vivaldi, Max Richter, “Elgar Unwrapped” and Beethoven in Romsey Abbey. Renowned teacher & conductor mentor. 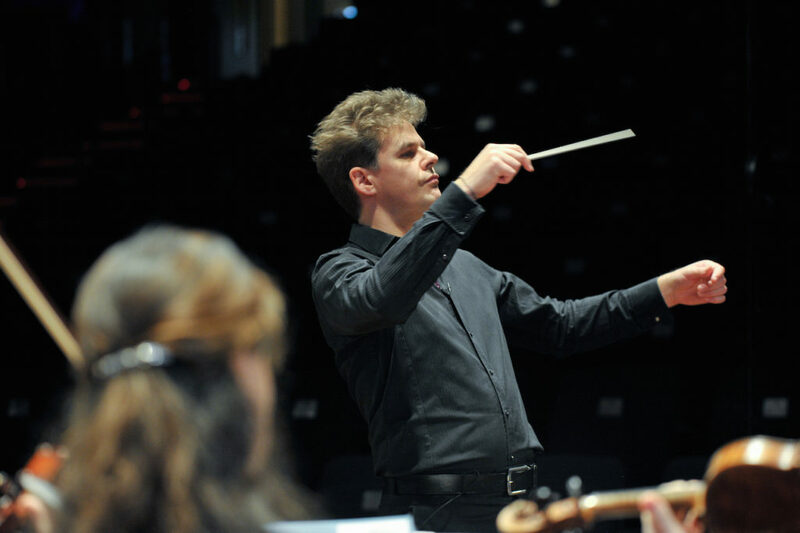 A widely-respected conducting teacher and coach, Robin has successfully mentored the careers of many conductors. He regularly gives masterclasses, CPD workshops and offers consultancy work and professional training, in addition to online and one-to-one conducting tuition. This season: all the concerts, soloists & repertoire. Robin performs throughout the year with orchestras in the UK and on tour in Europe, as well as presenting educational events and masterclasses. 2016-17 is full of richly varied repertoire, featuring an exciting line-up of soloists including Jennifer Pike & Thomas Gould. Read on and catch Robin live in concert. Say hello, ask a question or suggest some collaborations. Fill out the contact form to say hello and send Robin a direct message. We’ll make sure it gets passed on and will endeavour to reply as soon as possible. If your enquiry is about bookings & availability, press interviews, SÓN or Robin’s teaching & coaching work, please choose one of the links on the contact page.